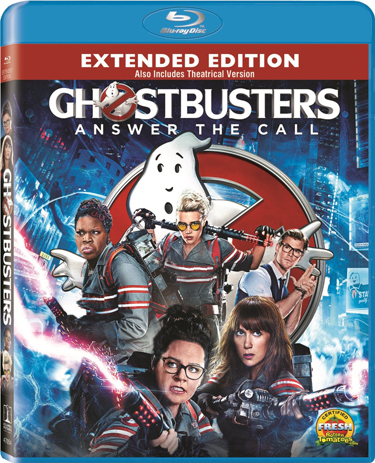 Proton-packed and taking the supernatural world by storm, the GHOSTBUSTERS: ANSWER THE CALL EXTENDED EDITION debuts on digital September 27 and on 4K Ultra HD/Blu-ray 3D Combo Pack and Blu-ray October 11 from Sony Pictures Home Entertainment. Armed with more ghostbusting action and plenty of attitude, the new EXTENDED EDITION features more than 15 minutes of never-before-seen film footage. Director Paul Feig brings his fresh take to the supernatural comedy, joined by some of the funniest actors working today. Academy Award nominee Melissa McCarthy (Best Supporting Actress, Bridesmaids, 2011), Kristen Wiig (Bridesmaids), Leslie Jones (“Saturday Night Live”), and Kate McKinnon (“Saturday Night Live”) comprise the team of four dynamic women, along with Chris Hemsworth (Thor), who prepare for an epic battle in Manhattan as mischievous ghouls descend on Times Square. The EXTENDED EDITION Blu-ray and digital releases come loaded with both the extended edition and theatrical version of the film along with an incredible treasure trove of bonus features, including 15 deleted, extended and alternate scenes, gag reels, filmmaker commentaries, plus more than 60 additional minutes of extended and alternate scenes available with Ultraviolet download. Five featurettes give fans an inside look at the supernatural visual effects, the “making-of” the ghosts from the film, an in-depth insight into the team’s look, attitude and weaponry, as well as the casting of Chris Hemsworth as the Ghostbusters’ new favorite receptionist. See loads of outtakes with six Jokes-A-Plenty alternate take reels and get an inside peek at how the set was slimed including a recipe to make your own slime at home! In addition to hours of special features, the Blu-ray release has been customized to give the ultimate in-home viewing experience. Using a dynamic frame break effect, you will see proton streams and ghosts leap off the screen! The 4K Ultra HD features four times the resolution of high definition, high dynamic range (HDR)–which produces brilliant highlights, vibrant colors and greater contrast on compatible displays. Plus, your home theater will be haunted by the stunning sound design with Dolby Atmos audio, remixed specifically for the home theater environment, delivering captivating sound that places and moves audio anywhere in the room, including overhead. The three-disc EXTENDED EDITION 4K Ultra HD/Blu-ray 3D Combo Pack includes the 3D theatrical version of the film in addition to all of the extras found on the Blu-ray. 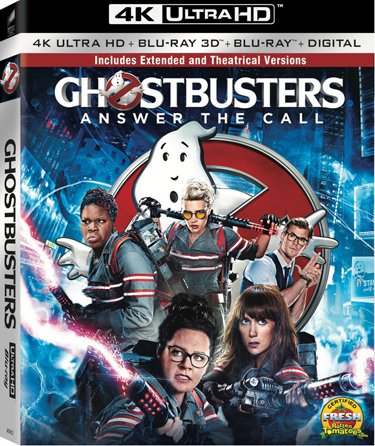 GHOSTBUSTERS: ANSWER THE CALL will also be released on stand-alone DVD October 11th featuring the theatrical version of the film along with select bonus feature content. 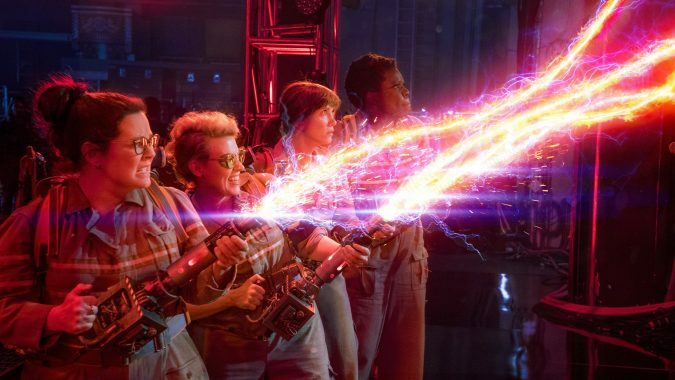 The franchise makes its long-awaited return with Director Paul Feig’s unique and hilarious take on the classic supernatural comedy, led by the freshest minds in comedy today, Melissa McCarthy, Kristen Wiig, Kate McKinnon, Leslie Jones and Chris Hemsworth. Together they team up to save Manhattan from a sudden invasion of spirits, spooks and slime that engulfs the city. 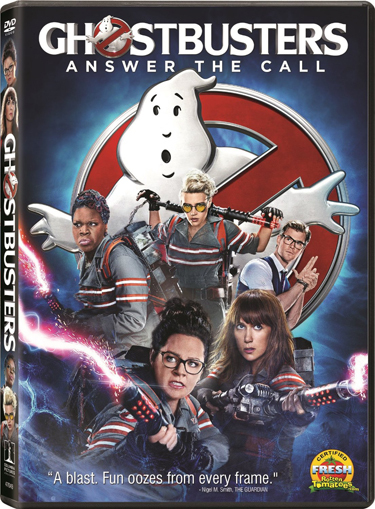 Directed by Paul Feig and written by Katie Dippold & Paul Feig, GHOSTBUSTERS: ANSWER THE CALL is based on the 1984 Ivan Reitman film, written by Dan Aykroyd and Harold Ramis. It is produced by Ivan Reitman and Amy Pascal and executive produced by Paul Feig, Jessie Henderson, Dan Aykroyd, Tom Pollock, Joe Medjuck, Ali Bell, and Michele Imperato Stabile.